In 2015, Rich Saulnier wrote to tell the story of 'Orange Crush'. Rich was assigned to the 432nd Tactical Drone Group and the 6514th Test Squadron from 1976 to 1980. 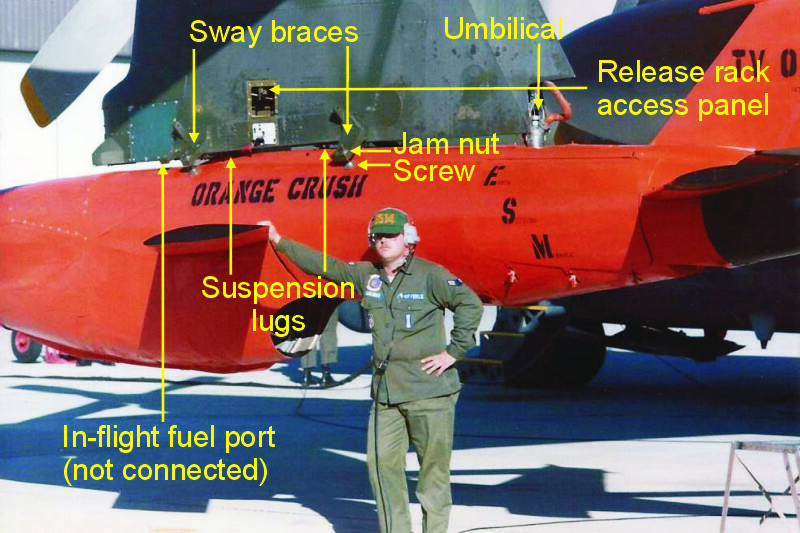 'Orange Crush' was his project, and it was built by him and others in 1978 from an AQM-34K wreck to be a MARS practice drone. The unique flasher windows of the AQM-34K version (a night reconnaissance version) were already covered with sheet metal before the restoration started. Rich did a lot of body work on it, and then it was then painted international orange with black wing and tailplane tips. For a display for Air Force days at Hill AFB, he added a old 50 caliber gun barrel (with the air cooling shroud) and gun sight to the nose. After that it was used mainly for MARS capture training, without the gun of course. Apart from 'Orange Crush' painted on the middle of the fuselage, it also had 'ESM / Earth Seeking Missile' painted on the rear fuselage (both sides), which was a private joke because it had hit the ground so many times. When 'Orange Crush' was used for MARS training, it was set to glide and then deploy the parachutes with an electronic timer. The control surfaces were fixed in place, since the airframe was set and balanced for MARS missions. 'Orange Crush' did not have an engine. With no engine, fuel or oil, it was necessary to put weights in various places in the airframe to get the center of gravity right. The drone retained the basic electronics and battery pack to power the explosive bolts for the parachute cans, the squib cutter for the cable of the smaller stabilization chute, and the main parachute cut-away G-switch etc. Occasionally other electronics were installed for testing. These missions would be flown as a captive (non-drop) flights, and the drone stayed on the pylon. Non-drop missions to test electronic gear were flown with an empty parachute can to maintain aerodynamic stability. Rich supplied these photos of 'Orange Crush' that were made during a preflight check on 10 November 1979. Rich is wearing headphones that are plugged into the DC-130, allowing communication with the Launch System Officer (LSO). The Firebee is clearly without an engine. The photos shows the markings that were painted with a 5 inch Reese stencil. 'Orange Crush' was sprayed on with a partially lifted mask, which has an interesting effect. The tail was marked as 'TV 02', short for 'Test Vehicle 2'. Underneath the 'TV 02' marking, the last four of the serial number (1639, short for 67-21639) are painted with a 1 inch stencil. The parachute cans have white stencils with 'Warning explosives installed' text. The 100th AMMS website shows two similar photos of 'Orange Crush', with Steve Mooney doing a preflight check in 1980: photo 1 and photo 2. The first photo shows the field applied sheet metal work behind the exhaust, a cover over the flashers of the AQM-34K. Inspired by the Teledyne-Ryan video F 1751 Ryan Aeronautical Model 147 Firebee delivery prep, flight test, recovery by the San Diego Air and Space Museum, Rich Saulnier wrote down the upload procedure. It was done from memory so there might be some steps missing or out of sequence. The photo below the procedure shows most of the items mentioned. While one technician stays up on the pylon, another technician will stand out in front of the drone (5 meters or so) and direct the pylon technician to tighten the sway brace screws as required to align the tail of the drone with the trailing edge of the pylon and that the wings are level. The sway brace screws are fully tightened up and locked down with jam nuts. Verify, by going in the aircraft to the flight command station, that no power is connected to the drone umbilical. At the launch control station there is a main power switch that has a red safety cover that must be safety wired closed with a red warning ribbon attached. Usually the drones were uploaded before any flight crew were on board. Note to item 14: Rich reported: "When the director aircraft was heavily loaded, with cargo or four drones with pods, and we were in a 115F degree plus environment (Arizona desert) the DC-130 would have a hard time getting off the ground with all that weight on board. So sometimes they would use the drone engines to add thrust to get in the air safely. This of course burns fuel and if the mission profile called for extended range flights they would top off the tanks using the pylon fuel connector. Also they could run the drone engines on the pylon for extended time to do testing or whatever and refuel it then before launch. Normally before upload we would be told if the refuel was going to be needed. If not needed we would not hook it up. If the conditions changed between upload and start up and it was needed it was a simple matter to go back and plug it in." Rich Saulnier described a typical MARS mission for Orange Crush as follows. A typical mission was take off with the DC-130 from Hill AFB. Some missions had two drones on the pylons, but most missions had a single Firebee. They also flew non-drop missions to test electronic gear. The Hercules would fly to Dugway Proving Grounds, land and unload the recovery team (typically two people) and their tools. The DC-130 would take off and launch the drone. After the MARS catch, it would be brought back by the CH-3 to a landing pad of old tires and was released onto that. The recovery crew would then lift it onto a Dugway-based AGE trailer. These yellow trailers were standard jet engine carriers, modified to carry the RPVs, and could be raised and lowered hydraulically. The DC-130 would land and the drone was loaded back onto the pylon, the recovery crew boarded and the team would fly home. Orange Crush never failed to be caught as long as Rich was there. However Rich thinks it was missed a few times before the restoration. Rich kindly supplied the following mission photos, showing 'Orange Crush' on the pylon and being dropped. The third photo shows some stencils on the nose section, that most likely read 'Launch wt / recovery wt'. Rich made some photos of the 6514th Test Squadron's operations at Hill. The first photo shows DC-130E 61-2371, with empty drone pylons, that used the callsign 'Vespa28'. Parked in front of the Hercules is a Chevrolet P30 Step Van, the squadron's shuttle van with call sign 'Sierra-3', painted in Insignia Blue. The second photo shows a CH-3 in SEA camouflage on the left, and a CH-53 in light gray on the right. The third photo shows an Air Logistics 4000 positioning trailer at Dugway, with the helicopter plus drone approaching in the distance. In the fourth photo, a CH-53 lowers the drone (an AQM-34M) onto a pad of used tires. Rich would sometimes drive a tractor trailer transporter (see transport trailer photo on 100th AMMS website) to Dugway from Hill to recover a drone if for some reason the DC-130 could not land or had other duties after the launch. When an RPV was to be trucked back, the drone was loaded directly on the trailer that had a custom mount, using a heavy duty fork truck. The wingtips were removed and safety flags and 'Wide Load' warning signs were hung on the front and rear of the transporter. During RPV recovery missions at Davis Monthan AFB (432 DGS) and at the Gila Bend test range used an A-16 recovery crane (see photo on 100th AMMS website). Craig Kaston attended the Point Mugu Open House on 17 September 2004, and found 'Orange Crush' derelict. He was told it was a training article for air and sea recovery. As you can see, it went through some hard times! 'Orange Crush' has since been moved and is no longer in this area at Point Mugu. Craig also remembered seeing this very Firebee in the nineties under DC-130 570461 at a Point Mugu open house. Clearly, later in its life other leftover parts had been grafted on on 'Orange Crush', giving it a mishmashed look. It appears that the nose section of an AQM-34M (Model 147SD) was used, identifiable by its unique film reel bulges. The camera window configuration appears to be correct for an AQM-34M, however the radome is not correct for this model. Craig concluded that the engine nacelle once belonged to an AQM-34L. It shows bare metal seams and panel joints, and this typical sanding was only performed on the eight AQM-34L models used in the 'North Warning' system tests performed in Alaska in May-July 1989. Craig's photos show several interesting airframe details of the original orange airframe, especially the fuselage just behind the exhaust. The sheet metal on the rear lower fuselage, behind the exhaust, is typical for re-used AQM-34Ks, to cover the flasher windows for night-time photography. However, in this case it appears that the sheet metal has been replaced, because earlier photos show an orange painted panel. The louvres behind the bare metal panel, and the two small air inlets on the right rear fuselage are also unique to the AQM-34K version. Because of the composite airframe, the paint scheme of the Firebee combines the standard Air Force light grey on the front fuselage with some kind of high-visibility orange on the center and rear fuselage. Both sides of the fuselage feature the 'Orange Crush' nickname, and on the rear right fuselage the name 'Earth Seeking Missile' is seen, or 'E S M' if you view it from a distance. If you look closely, you will also see eyes painted on the sides of the film reel bulges! In 2008, Craig identified 'Orange Crush' as 67-21639, based on a photo. Its Teledyne-Ryan identity was SRE-14, the 14th model 147SRE / AQM-34K. In the background of one-but-last 2004 photo is a pallet with interesting stencilling. This may or may not be the identity of the replacement nose part of 'Orange Crush'. The serial number fits in the known AQM-34M serial block 70-1108 to 70-1185.